Last week, early box office tracking numbers came in for Avengers: Infinity War, putting its opening weekend between $175 million and $200 million, but new numbers indicate it'll be much higher. The initial projections surprised many fans, since it came in under Black Panther's impressive three-day debut of $202 million, but a new report puts its opening weekend between $235 million and $255 million. If it reaches the high end of this projection, it would eclipse the $247.9 million record set in December 2015 by Star Wars: The Force Awakens. With less than two weeks to go, and anticipation growing by the minute, it may be possible for Avengers: Infinity War to break The Force Awakens' three-year box office record. These new tracking numbers come just days after ticket retailer Fandango reported that Avengers: Infinity War was out-selling the past seven Marvel Cinematic Universe movies combined, and that its ticket sales were already double what Black Panther had made at the same point in both movies' pre-release cycle. It wouldn't be surprising if these projections continue to increase with just two weeks left until its release, and one week until the Los Angeles premiere on April 23. Here's an excerpt from this new tracking report below. "Infinity War is redefining the ceiling of pre-release buzz for the superhero genre. Following last week's increase in tracking projections, Fandango reported a few days ago that the massively anticipated semi-finale to the last ten years of the Marvel Cinematic Universe is outselling all MCU titles (dating back to 2015's Ant-Man) combined through the same point in the pre-sales cycle. Our own social media metrics continue to reach new heights for the genre, with Twitter activity notably performing 129 percent higher than Captain America: Civil War and 52 percent higher than Avengers: Age of Ultron at comparable points in the pre-release cycle. Outside the MCU, Infinity War is well ahead of Star Wars: The Last Jedi and approaching levels similar to those of Star Wars: The Force Awakens. The Marvel epic's chances at reaching that latter film's all-time opening weekend record of $247.97 million are increasingly possible based on current trends." While these opening weekend projections have Avengers: Infinity War either breaking, or coming close, to the $247.9 million opening weekend record set by Star Wars: The Force Awakens, this report also claims that Avengers: Infinity War will not come close to the all-time domestic record of $936.6 million, also set by Star Wars: The Force Awakens. This projection puts the domestic tally between $565 million and $650 million. At the high end of this projection, Avengers: Infinity War would become the sixth highest-grossing movie of all time, between Jurassic World ($652.2 million) and Marvel's The Avengers ($623.3 million). On the low end, it would take eighth place between Star Wars: The Last Jedi ($620.1 million) and The Dark Knight ($534.8 million). 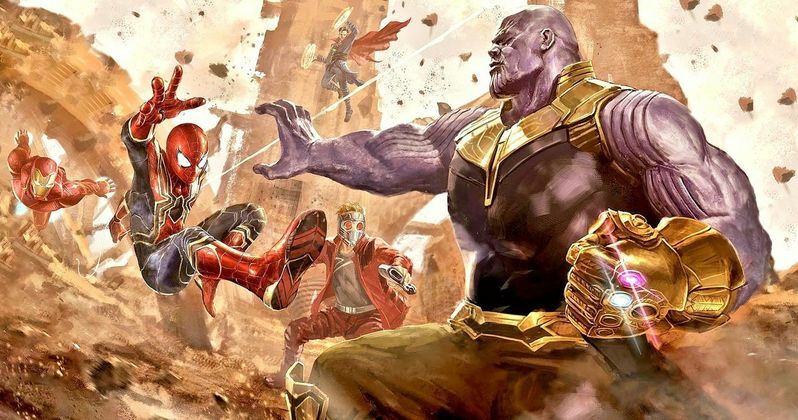 Regardless, Marvel's unexpected release date shift from May 4, the first weekend in May which traditionally signals the start of the summer movie season, and April 27, the last frame in April which is typically not a huge weekend, should not have any impact on Avengers: Infinity War pulling off a huge debut. As for whether or not it will break box office records, we'll find out in just 11 short days. You can head over to Pro.BoxOffice.com for their full tracking report.